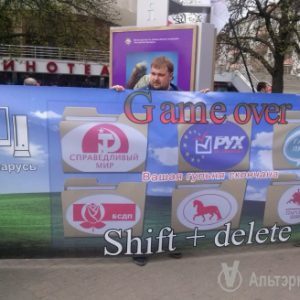 At the Chernobyl Way rally last month, activists from the opposition group Malady Front carried a controversial poster titled “Game Over.” The poster, listing most opposition parties and movements, highlighted the dire state of the democratic opposition in Belarus. Activist Mikola Dziamidzenka, who carried the poster, explained that the opposition parties are losing membership and legitimacy because senior figures are putting their ambitions above the common cause. Dziamidzenka’s statement follows the departure of Uladzimir Niakliajeu, one of the most prominent opposition figures, from the opposition coalition. Opposition leaders increasingly split from their parties and create civic movements, which combine political goals with social and cultural initiatives. A 2014 article by Konstantin Ash in Democratization suggests that foreign assistance for pro-democracy movements, combined with political repression within Belarus, may be to blame for the fragmented state of the Belarusian opposition today. According to Ash, opposition leaders have to campaign and challenge the regime to secure funding. The cycle restarts with each bout of post-election repression, when old movements divide and new aid-seeking entities emerge. During Belarus’s twenty-year history, eleven out of seventeen presidential hopefuls saw their run for office end in harassment, prison, or even exile. Despite this, the number of presidential candidates grew from just two in the 2001 election to three in 2006 and ten in 2010. Their vote shares, on the other hand, fell from a maximum of 16% in 2001 to 6% in 2006 to 2% in 2010. Nonetheless, three opposition politicians have already declared their intention to run in the November 2015 election: Anatoly Liabedzka, Chairman of the United Civic Party; Taciana Karatkevich of Tell the Truth campaign; and Siarhei Kaliakin of the left-wing party The Free World. While some argue that this is the only opportunity to legitimately reach a broader constituency in Belarus, others see the absence of a unified candidate as a weakness. New members are hard to recruit due to the low visibility of the opposition, the persistent lack of electoral success, and the high risk of being associated with groups that oppose the incumbent regime. Intraparty conflicts sometimes lead to the outflow of existing members. Many current members of opposition parties joined in the 1990s, at the height of Belarusian democracy. Newcomers also join during election years, when the opposition is most prominently displayed in the media. Recruitment through friends and professional networks predominates – "few people come in from the street", Barysau said. Belarusian Christian Democracy, an unregistered party founded in 2005, has enjoyed the greatest gains in the number of supporters. The party recruits during campaigns, via social networks, and by keeping detailed records of people who have attended its events. According to Dzianis Sadouski, each potential supporter is contacted at least two to three times. An analysis of media references by the Belarusian Institute for Strategic Studies (BISS) in 2014 suggests that, around one-third of the time, individual politicians from the opposition are mentioned without party or movement affiliation. State harassment of opposition politicians is especially effective because the opposition movement fares poorly without strong leadership. For example, while the 2006 presidential candidate Alyaksandr Kazulin was in prison, the Belarusian Social Democratic Party (Hramada) nearly fell apart due to the contentious decision to reshuffle leadership. The party endured another crisis following the departure of chairman Anatol Liaukovich, who was accused of breaking the party's charter, in 2011. Another 2006 election candidate, Alyaksandr Milikevich, lost leadership of Coalition Plus Five following incarceration. He reacted by forming his own movement, For Freedom. Last month, Uladzimir Niakliajeu, the most recognisable among the opposition politicians, left the opposition coalition People’s Referendum and announced plans to create a new movement for the statehood and independence of Belarus. The emergence of yet another entity would exacerbate the fragmentation of the opposition. For the Belarusian opposition, domestic electoral success and state financing lie outside the realm of possibility. But international popularity – and funding – are attainable. Trips abroad by some opposition politicians thus seem to play a disproportionate role when compared to party activities aimed at developing the domestic base. According to data collected by BISS, trips abroad accounted for 9.1% of all media references to opposition parties in 2013, and meetings with foreign politicians for 17.5%. At the same time, meetings with the domestic electorate made up just 27% of media references. Competition for international support, as well as close encounters with the Belarusian KGB and prisons, may explain why opposition leaders are so suspicious of each other. For example, in 2011, Stanislau Shuskevich of Belarusian Social Democratic Assembly called 2010 presidential candidates Alyaksandr Milinkevich and Yaraslau Ramanchuk traitors and criticised their invitation to a Warsaw conference on democratisation. The proliferation of movements, such as the one proposed by Niakliajeu, may be another product of the dependence on foreign support in a repressive political environment. The number of political parties – registered and unregistered – has remained constant since 2008, while the number of movements continues to grow. Establishing a movement carries several advantages. First, some international donors may feel uneasy when overtly seeking political influence by supporting political parties. Civic movements, in contrast to parties, can tap into a broader pool of international funding, adjusting their stated goals in accordance with the available grants. They can compete in both social and political spheres. Second, political parties lack the trust and confidence of the post-Soviet electorate. Being classified as a movement brings up fewer negative associations in Belarus and facilitates recruitment. It allows claiming legitimacy on grounds other than electoral success. One should not expect electoral miracles from an opposition that has no access to mass media or domestic funding. This November’s election is all but certain to end in another victory for Alexander Lukashenka, regardless of how united the opposition is. Having witnessed the aftermath of Maidan protests in Ukraine, the majority of Belarusians believes in “As long as there is no war!” and is willing to overlook the country’s deepening economic problems. Instead of playing Don Quixote and waiting for a Belarusian Maidan, the opposition should prepare for the long haul. That means building trust among the electorate, developing distinct party platforms, and aiming to influence particular policies of the Belarusian state. Belarus is returning to the international spotlight, but for once, not just as the “last dictatorship in Europe”. The two summits that Minsk hosted in the past year on the conflict in east Ukraine indicate a tentative shift in Belarus’s political alignment. Yaraslau Kryvoi and Andrew Wilson analyze what the West should do in relation to Belarus in a paper produced jointly by the European Council on Foreign Relations and the Ostrogorski Centre. Although Belarus was more of a broker than a genuine neutral party at the negotiations that produced the two “Minsk Agreements”, the government has profound doubts about Russia’s assault on its neighbour’s sovereignty. But despite some changes in rhetoric, Belarus is not adjusting its foreign policy because it wants to change itself. Instead, Lukashenka wants to preserve his system from Russian pressure. But recent moves to strengthen Belarusian sovereignty and nationhood risk undermining his traditional method of balancing between the West and Russia. Lukashenka’s current overtures to the West differ from those he made in the previous period of tentative engagement in 2009-2010. That engagement ultimately failed because of the uneasy balance within a twin-track policy, with Belarus seeking foreign policy insurance against Russia by making token moves towards softening authoritarianism. This time, the second track is different. If the West seeks to engage, it will be by supporting Belarusian statehood, not by encouraging a putative domestic mini-liberalisation. The EU has two ways to respond, either based on geopolitics and concern about Russia, or based in an effort to strengthen Belarusian society in the longer term. Both would drop the conditionality approach of “more for more” in all but name. The EU would confine itself to supporting Lukashenka’s policy of adjustment towards Russia, but without expecting fundamental change inside Belarus, and without taking steps that might make relations with Russia even worse. A more productive approach would be focused on Belarus itself, and would renew the policy of “engagement” without the unrealistic hopes of 2009-2010. The EU would offer to assist in a more modern form of nation building, one that would gradually empower civil society from within. The possibility of fomenting a quick regime change in Belarus has been unlikely since at least 2006. The policy of engagement with Belarusian society recommended here would not be inconsistent with retaining individual visa bans and targeted sanctions imposed as a proportionate response to political imprisonment. So, instead of criticising the regime from the sidelines, this approach would aim at patiently increasing if the EU’s presence in Belarus. The focus should be not just on human rights, but more broadly on the rule on law, not so much on quick political changes but more on good governance and fighting corruption. Without a presence on the ground, the EU has no bargaining power. The EU should help to strengthen statehood and national identity politics as well as to counter the Russian propaganda machine. The EU should engage more across the board: in the first place, with civil society, which should ultimately create more demand for sovereignty, democracy, and the rule of law in Belarus, but it should also interact more with the bureaucracy at all levels. Europe should provide indirect economic assistance: conduct a dialogue on economic modernisation and help with WTO membership and with expanding the role of the European Investment Bank and the European Bank for Reconstruction and Development. The EU should encourage stronger cooperation between Belarus and Ukraine, to ease Russian pressure on both states. Countering Russian propaganda will be one of the most important tasks. The EU needs to confront aggressive anti-Western propaganda, which comes primarily from Russian media outlets in Belarus. Making independent media more accessible by means of increased and more effective trans-border TV, FM radio, and internet broadcasting would lead to more demand for democratic change. At the same time, Belarusians should be given better access to information about the EU, its history and values. Although the EU has a Representative Office in Minsk, much more should be done to promote the EU at universities (for example, by organising public lectures, exchanges, and essay competitions) or for the wider public through civil society organisations. The EU needs to continue supporting Belsat TV, which is based in Poland, but it also needs to go beyond that and empower local voices from within. In the past, the West has focused on educating human rights and opposition political activists about the EU and its values. But the Belarusian bureaucracy, the most influential group in Belarusian society, has much less understanding of the EU; it mainly gets its information from Russia-dominated media. Brussels should increase its work in experience transfer and should intensify educational programmes for officials (particularly the younger ones), focusing not on general geopolitical contradictions but on practical technical regulations, standards, and procedures. By engaging officials at all levels in meaningful cooperation, the EU will stimulate appetite for reforms in Belarus. The EU has paid insufficient attention to the role of national identity in Belarus. For instance, the European Humanities University in Lithuania, one of the largest donor-supported projects, has slowly drifted from being Belarus-focused to catering for a larger group of Russian-speakers in the former Soviet space. However, without the development of a stronger national identity, Belarus could easily become a part of Russia, particularly after Lukashenka is gone. Civil society groups should be supported, but so should the cautious steps of the Belarusian authorities, who are afraid to anger the Russian nationalists now dominant in Russia. This support should take the form not just of moral encouragement but also of concrete long-term programmes. This is one of the areas in which the interests of the Belarusian authorities, civil society, and the EU coincide. Lowering the visa barrier by decreasing visa fees and making them free for many categories of Belarusians would also strengthen pro-European sentiment in wider Belarusian society, as would developing business and civil society contacts. Currently Belarus receives more Schengen visas per capita than any other country. But most of these visas are issued for only a few days or months, forcing Belarusians to submit repeatedly to expensive, tedious and sometimes humiliating visa procedures. The EU should issue more multiple-year visas for Belarusians who have a good history of travelling to the EU. This should become a rule rather than an exception. 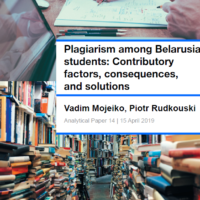 The EU's scholarship programmes, such as the European Scholarship Scheme for Young Belarusians, should be expanded to include exchanges of PhD students and academics. However, it is not enough to help young people leave Belarus and study at Western universities. It is equally important to create fellowship programmes to support Western-qualified Belarusians in returning to their home country to work in education, public sector, or policy- oriented organisations. That would address Belarus’s need for Western expertise and alleviate the brain-drain problem. Although the Eastern Partnership has largely failed to reach its objectives on Belarus, it is important to keep Belarus involved even just as a formal member of this club, to enable it to cooperate with Ukraine and other countries of the region on matters of mutual interest. Clearly, the current Belarusian leadership remains uninterested in the prospect of joining the EU, which means that it has a very different motivation to leaders of countries such as Ukraine. This means a more individualised approach is needed. Finally, many of the problems Belarus faces are similar to those of Ukraine. This should lead to the encouragement and funding of cooperation between Belarus and Ukraine at all levels (state and non-state), including common research initiatives, grant programmes, and exchange schemes for academics and policymakers. 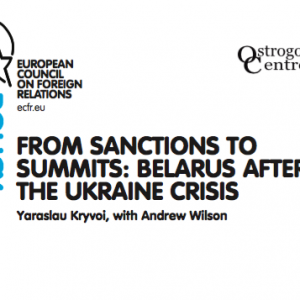 Read full paper From Sanctions to Summits: Belarus after the Ukraine Crisis.